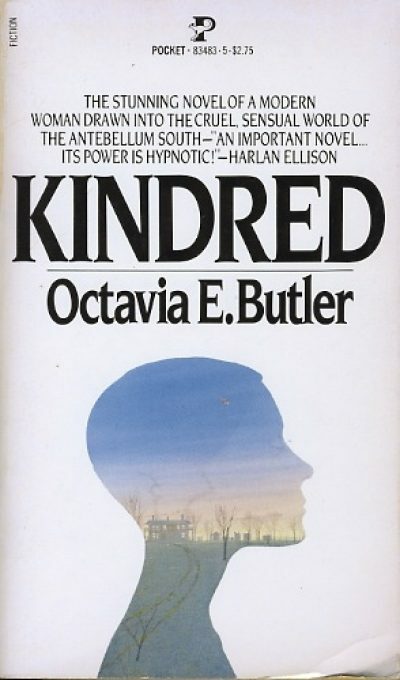 1979’s Kindred was Octavia E. Butler’s fourth novel, but her first standalone. Dana has lost an arm, and the police suspect that her husband Kevin knows a lot more about Dana’s injuries than either he or Dana are letting on. Dana is not covering up spouse abuse; she just knows that the police would never accept the truth: Dana is the victim of time travel gone horribly wrong. It all began on Dana’s 26th birthday, when she was drawn—somehow—from June 9, 1976 to the early 1800s, just in time to save young Rufus Weylin from drowning. Attacked by Rufus’ panicked mother, Dana returns—somehow—to 1976. Unable to explain the episode, all Dana can do is hope it is not repeated. A vain hope. Rufus has two remarkable talents: his propensity for autodarwinification and his ability to summon Dana to him across the century and a half between them. Although there is never an explanation for how Rufus manages the second, there is a very suggestive connection between Rufus and Dana. If he lives long enough, he and a woman named Alice Greenwood will have a child named Hagar Weylin and from Hagar will spring a lineage that leads to Dana herself. That’s a big if, one that depends on Dana appearing out of time, over and over, to save her foolish ancestor from himself. Rufus isn’t just a self-destructive idiot. He’s the son of a brute and the product of Maryland’s brutal, slave-exploiting culture. He is not only ignorant and often cruel; he is also white and well-to-do. In 19th century Maryland, that means he holds all the cards. His lover Alice isn’t nearly as lucky: she is free but, like Dana herself, black. There is little she can to do protect herself when Rufus fixates on her. And not much more Dana can to protect herself…. And by the way, I wanted to point out that Kindred is not science fiction. You’ll note there’s no science in it. It’s a kind of grim fantasy. Which I guess just shows the various attempts to draw a firm boundary between science fiction and fantasy are mostly bunk. It does make me wonder how she classified her Patternist books. 1) She will suffer immediate and brutal punishment if she resists.2) If she does not play her role properly, thus enabling exploitation and tragedy, she will blink out of existence. Dana is desperate to survive. She also hates herself for her complicity in evil, but she finds herself unable to make any other choice. Butler tells us more than we might want to hear about how awful slavery is for the slaves. (It’s not that great for the slavers, either, or at least not for Rufus. But screw them, they’re slavers, by definition beyond redemption.) It would be nice if it were no longer necessary to demonstrate, over and over and over, that slavery does not exist to benefit slaves, but of course to believe in the beneficence of slavery would be … all too damn common. 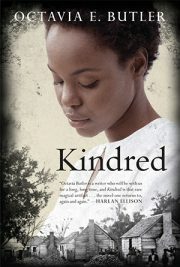 Kindred is available from Beacon Press1. There is also a radio play adaptation available here, which I would only recommend as an example of how not to adapt a remarkable book. I had no idea! My paternal grandparents were Unitarians, which is why that detail caught my eye.